Aiptex PocketCinema V10 - cinema to go? 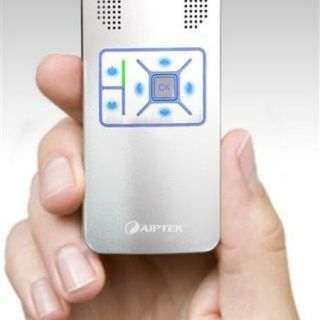 Aiptek has unveiled a new pocket projector device at Computex in Taipei this week called the PocketCinema V10 - which uses 3M technology to deliver up to a 50 inch image on the go. The PocketCinema V10 has 1GB internal memory, a built-in speaker and a 3-in-1 multicard reader compatible with SD, MMC and MS Pro cards. You could also choose to display your pics or movies on the go from your cell phone, iPod, Wii or other video capable device. No details as yet on pricing or availability in Europe and the UK, but you might want to check out Aiptek.com for more details.